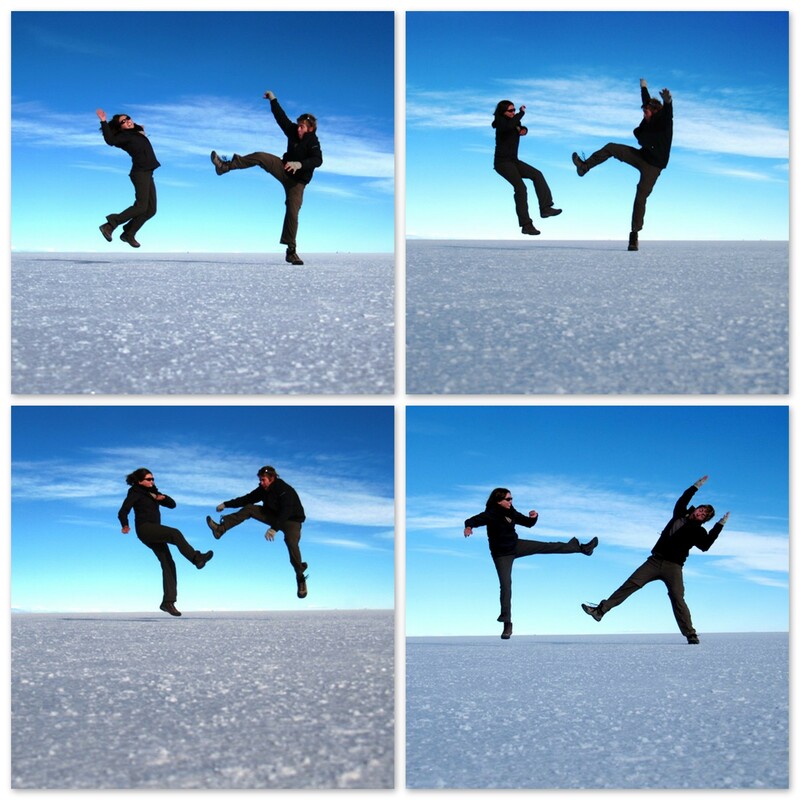 We rush to get our stuff together, we grab our jackets, the tripod and the camera...today we are going to the salt flat. 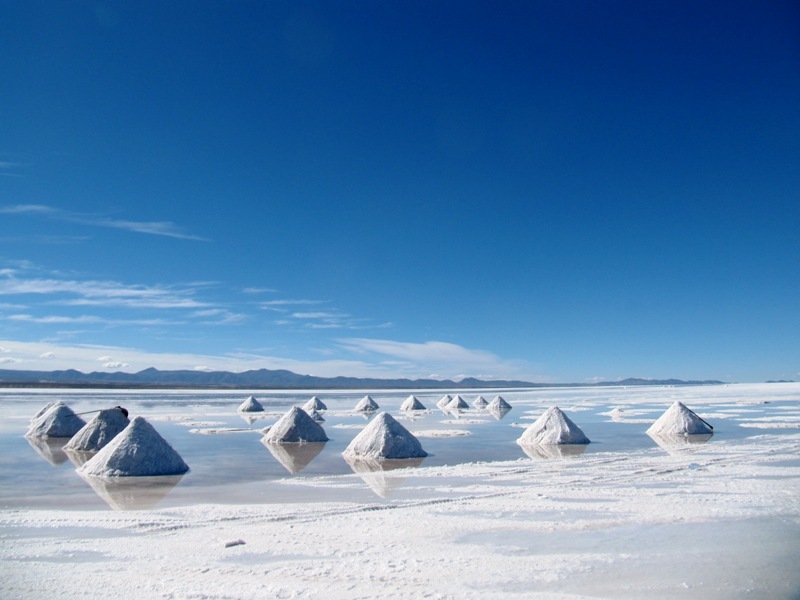 Bolivia has the biggest dried salt lake in the world – the Salar de Uyuni. 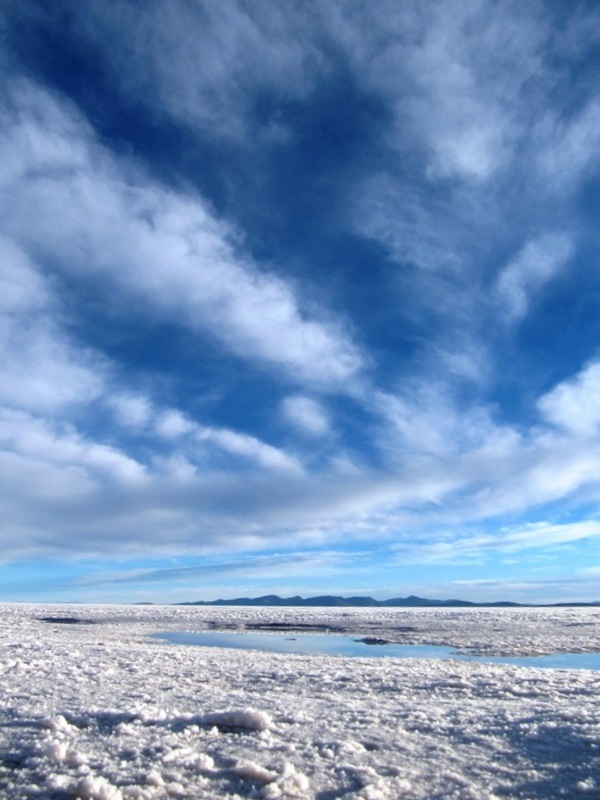 The salt lake is so big that it contains more than 60% of the worlds lithium and covers about 4100 sq.mi. (the equivalent of 10 NYC’s). 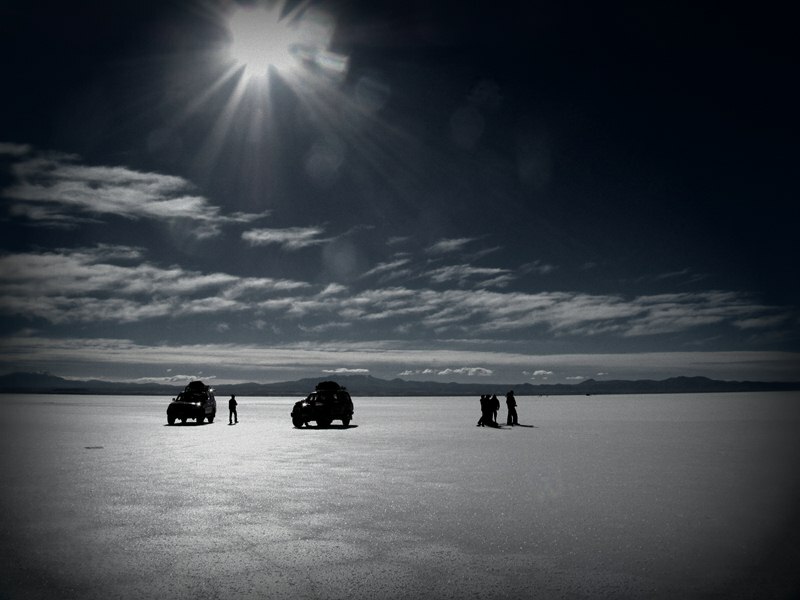 Our jeep drives right onto the salt flat and in no time we are speeding along in the darkness with a destination that none of us can see. 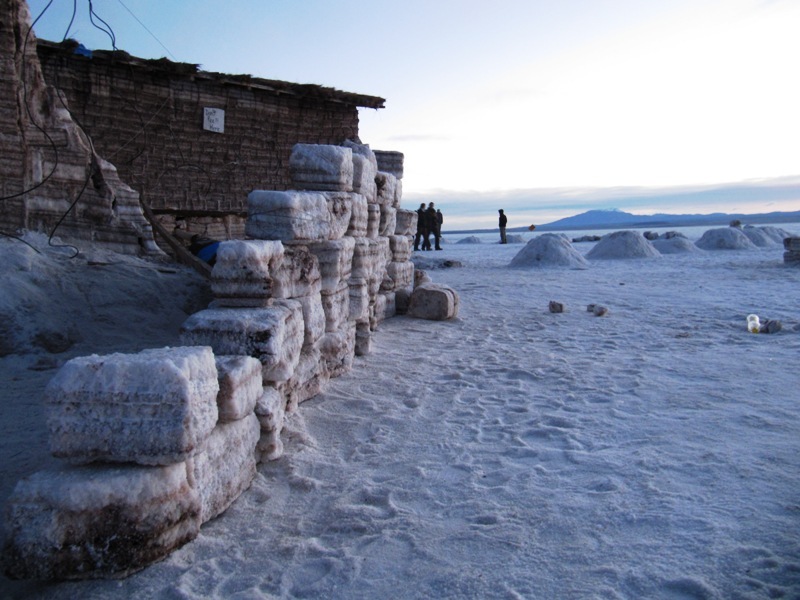 We arrive at a hotel de sal which is a salt made building in the middle of the flat. We had breakfast of bread jam and mate de coca while sitting on salt-carved tables and stools. The sun slowly crept to the horizon and filled the sky with bright pinks and orange. Gradually the golden light crept to our feet revealing a flat expanse of solid white. 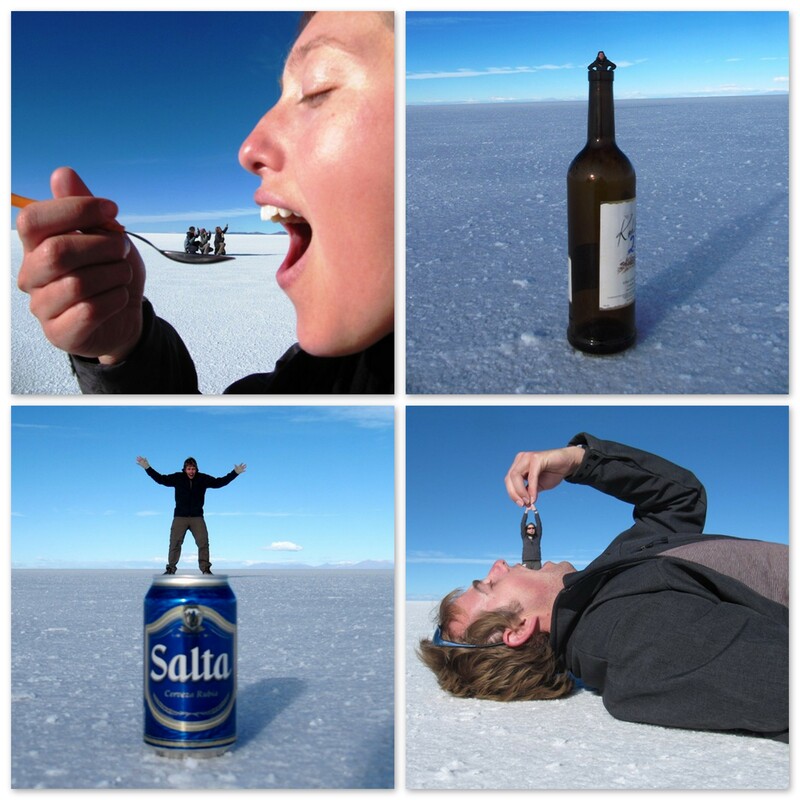 We had to convince our minds that it was in fact salt because the coldness and bleakness of the salar tricks the mind that it is snow. And then the jumping photos began… The reason for this? When else will we be in an environment surrounded by flat white with the visual effects of high-flying kicks? We also had quite a bit of fun playing with some beer cans and bottles. We did our best to remember the Honey I Shrunk The Kids movie infused with a little imagination of our own. It came down to a showdown between the couples: Carmen and I won! One, two three! Ready, squat jump! were words repeated over and over again and with each leap a medley of laughter as each of us tried to time the best karate kick and jump into the air. Finally it came down to a competition between the couples. Mark, Sally, Silvio and Mila had impressive jumps, Matteo and Gosia had the height, but could not synchronize after fifty or so jumps, but in the end it was Carmen and I that had the best leap (note: if any of you disagree, send me the photo and we’ll have a vote.)! And there were group shots, many many group shots, leaving us all out of breath and our jumping legs throbbing. We attempted to walk out of wine bottles, or being blown from hair dryers, or even squished by a shoe. All in all it was a morning filled with laughs and fun with our friends. 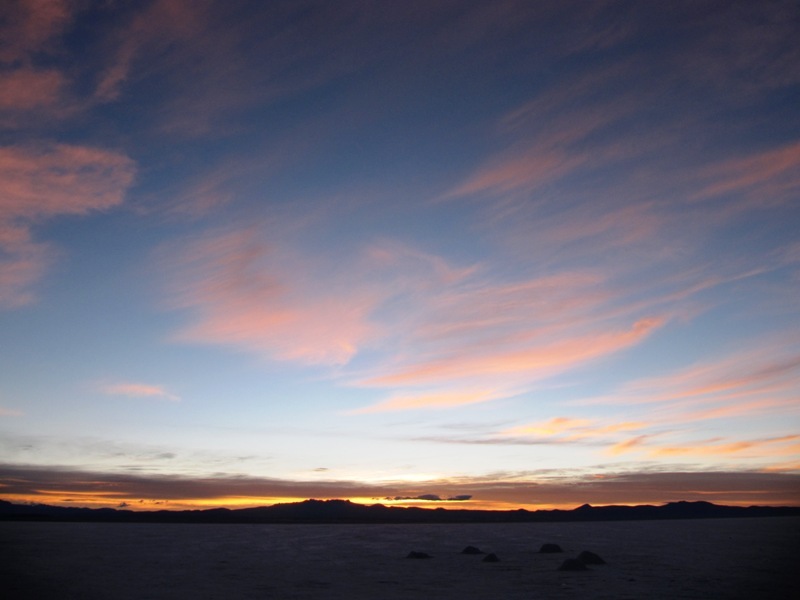 Exhausted, we made our way from the salt flat. On the outer edges the people harvest the salt into large cones for drying then refining. 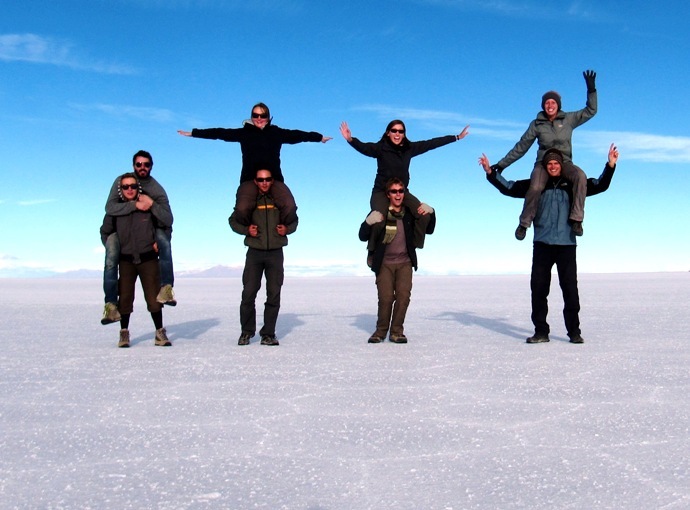 In Uyuni we scheduled a bus for Potosí. 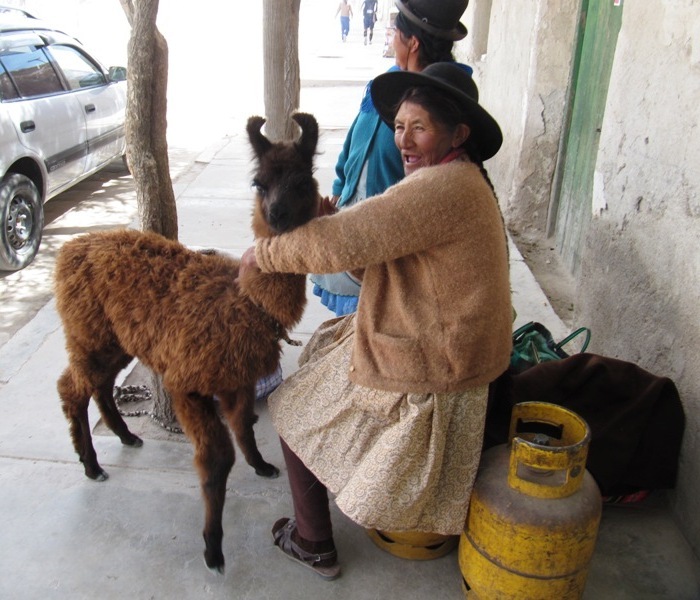 We were rushing to get to the bus when we were stopped in our tracks by the cutest baby llama. The woman attempted to hold it down for me, but it was quite restless. We clamber onto the bus and shove our packs between our legs. Our bodies were exhausted form the repetitive jumping, and our minds overloaded and jaded from the amazing views. The grandeur and magic of the scenery of the last 4 days was sensational. There were carved surreal landscapes, painted lagoons, expansive canyons and colors, vibrant colors that I did not imagine were possible at a large natural scale. Looking back on it, I have a hard time fathoming all the wondrous beauty that we saw. 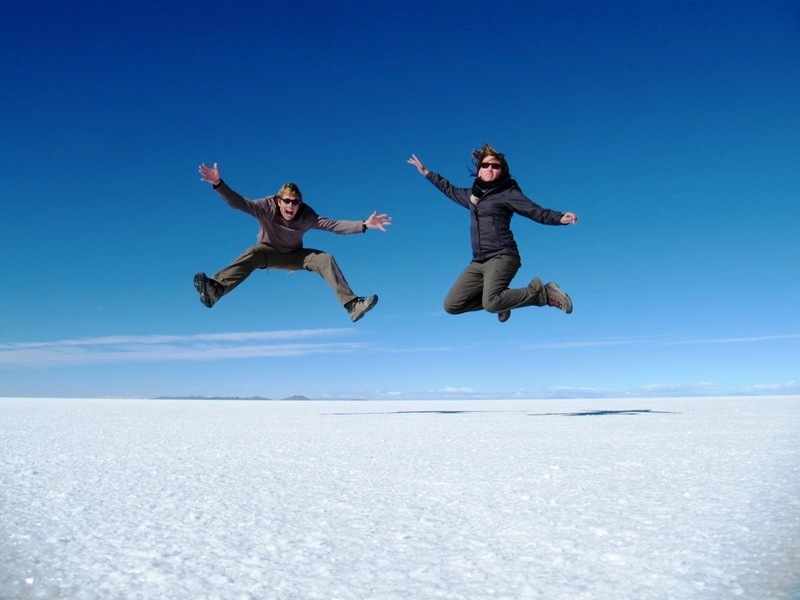 A Salar de Uyuni trek should be on everyone’s South American itinerary! Our bus bounced along the roadway, jiggling and rattling its way up the mountain dirt roads. Only the main streets are paved. The vibrations are quite soothing, but the bus continues to acquire more and more people. Within the first hour our the entire aisle has also filled with people scrambling to hold on as the driver twists and turns the bus at each corner. A woman next to us held a plump baby with a shawl wrapped around her back. On her front, several other bags hung from her shoulders; her one free hand clawed at doorjamb for stability. After a couple hours the baby became restless. I offered for her to lean the baby on my backpack that was on my lap, instead she passed me the chubby baby. We giggled and made faces at each other for the next hour. I attempting to entertain it with the few items that I had accessible, but my red water bottle did not have much success for long. She was a cute little thing and I escaped with minor droolage. I was asleep seconds after passing the baby back, my head swayed from side to side as we climbed into even higher mountains. When awoken at my new destination, it was me that had been drooling.